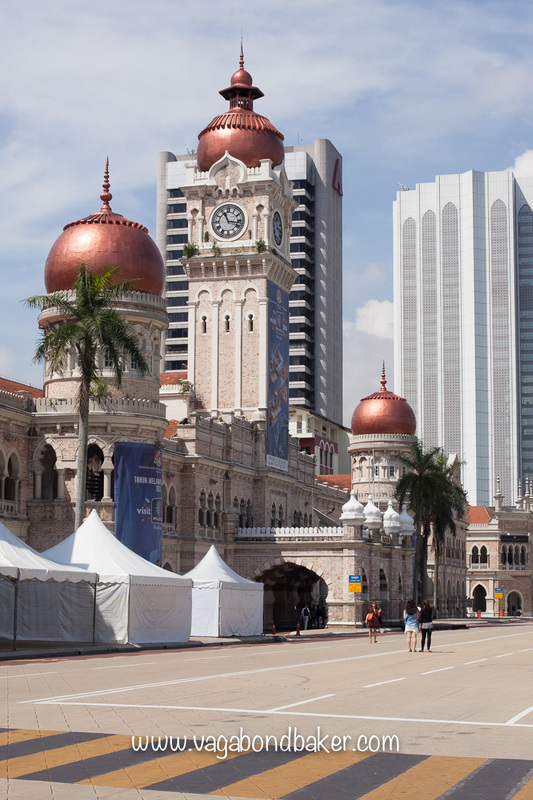 Malaysia’s capital city is often overlooked by travellers, a convenient transit hub for South East Asia. 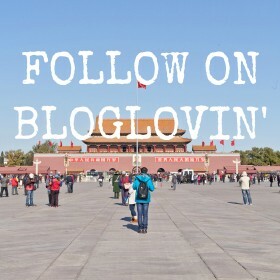 This is a mistake though, there is so much to see and experience in this vibrant city. I’ve been to KL a few times now, each time discovering something new. 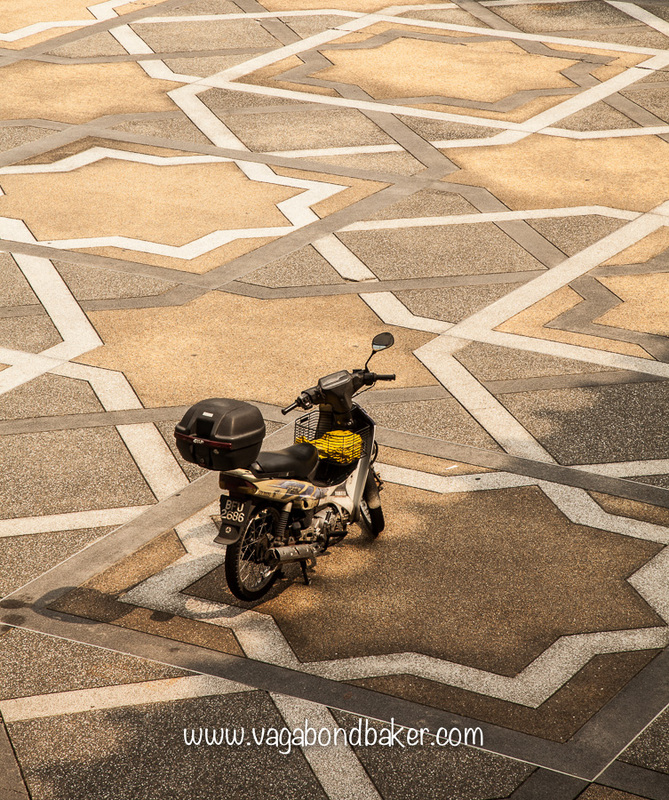 The National Mosque is top of my list for a couple of reasons: architecturally it is sublimely photogenic, a light and airy space with lacy geometric designs; it is a pleasure to pad barefoot on the cool tiles, a serene place in a busy city. 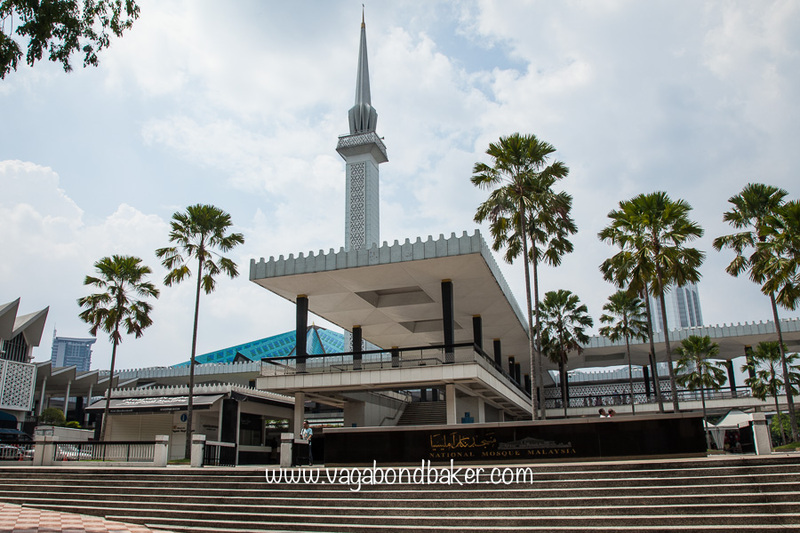 In such a multicultural country it is good to tap into the official national religion and Masjid Negara is at the heart of Islam in Malaysia. 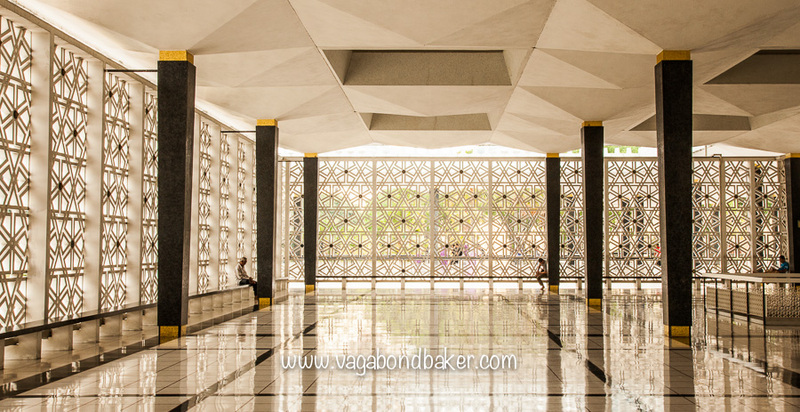 It was built in 1965 to celebrate Malaysia’s peaceful independence. The main dome looks like a bright, tiled umbrella and the tall minaret towers elegantly over the courtyard. The National Mosque welcomes non-Muslim visitors outside of prayer times, you will need to dress conservatively. Most of the women, on the day I visited, had to wear a purple robe – even I, despite wearing long trousers and long sleeves. Men in shorts did too. I kinda liked the robes, great for photography! It took me two visits to Kl before I visited this gem; just across from the National Mosque, this museum is a glorious feast for the eyes. 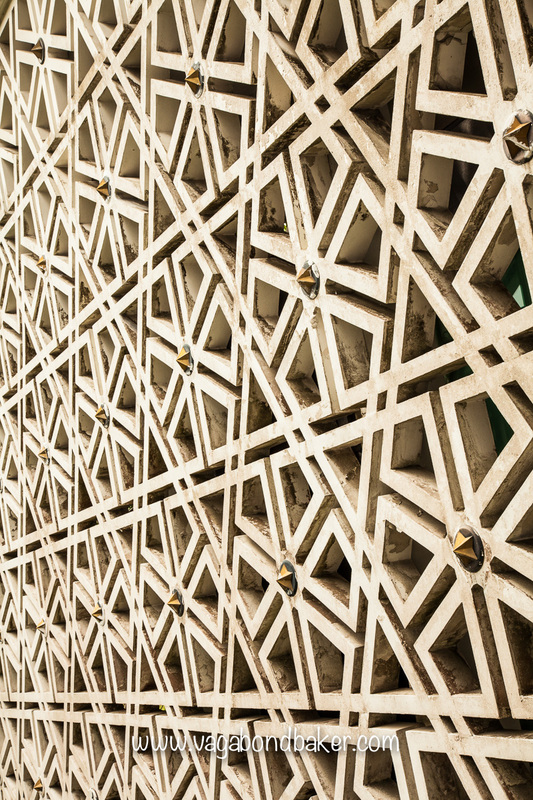 Housed within a smart modern building, the galleries show off some of the most spectacular examples of Islamic art in the world. The first gallery, and possibly my favourite, is a three-dimensional visual guide to Islamic architecture: a room of detailed models of prominent mosques around the world. I spent a long time peering into miniature buildings, reminiscing of previous trips where I’d walked across those actual courtyards: the Umayyad Mosque in Damascus, the Blue Mosque in Istanbul, the Great Mosque in Xi’an, China. 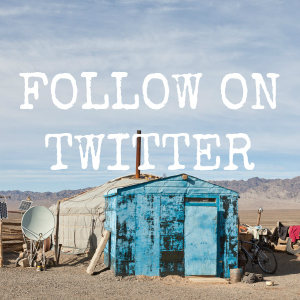 And then there were those I had yet to see, Uzbekistan, Iran– oh feet take me. In another gallery a man came over to chat, with his silent sister. He was visiting Malaysia from India, had I been? Did I like it? Was my husband nearby? No (Chris has flown back to China for a few days and I was enjoying wandering KL by myself), I changed the subject, explaining how much I was enjoying the art in the museum. We were stood near the huge Ka’aba shroud and he rhapsodised over its importance, a proud twinkle in his eye. The beautiful embroidered black silk had covered the holy Ka’aba, in Mecca, in 1964. I had a memory card brimming with photos from this museum: photos of beautiful fabrics, magnificent calligraphy, exquisite illuminated manuscripts, tiles, weapons and jewellery. I lost them all. All the photos from my last week in Malaysia, gone: I’d forgotten about the card, never backed it up then formatted it in haste at a wedding. Let this be a warning: always back up your photos! Buildings rarely come as iconic as this duo of towers, instantly recognisable and perfectly representative of the country. The base of each tower forms an eight-pointed star, a recurring pattern in the Islamic world, and the towers taper up to their spired pinnacles. Up until 2004 they were the tallest buildings in the world. 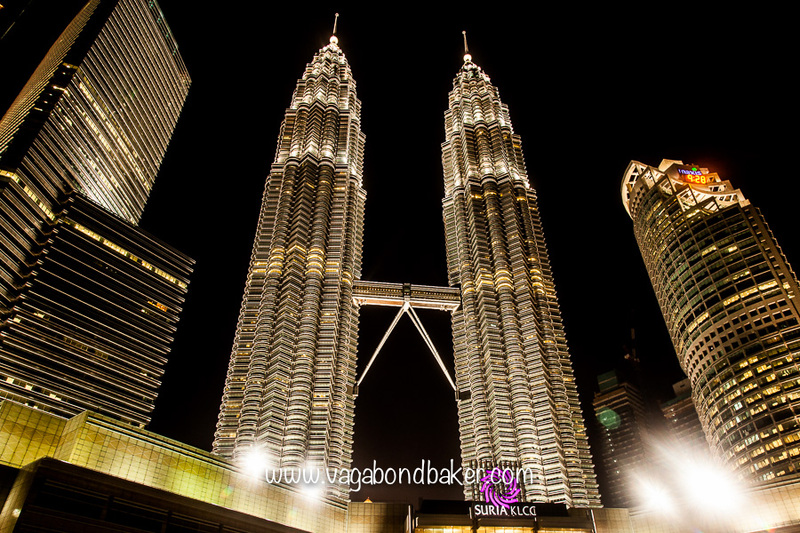 A night the Petronas Towers come alive: illuminated, they spiral up into the darkness, piercing the night sky. A glittering M for Malaysia. 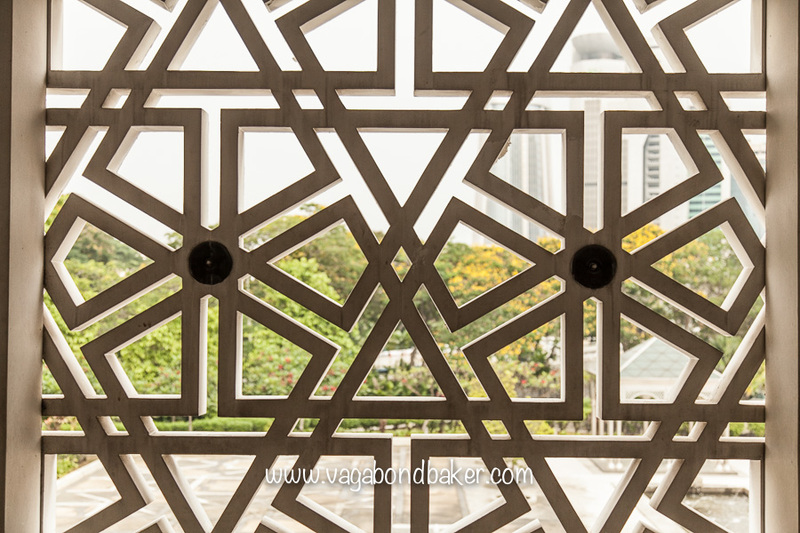 They stand within the KLCC park, a green escape from the urban surroundings. Underneath the glamorous towers you can find the Suria KLCC, a chic western-style shopping mall crammed with well-known stores. 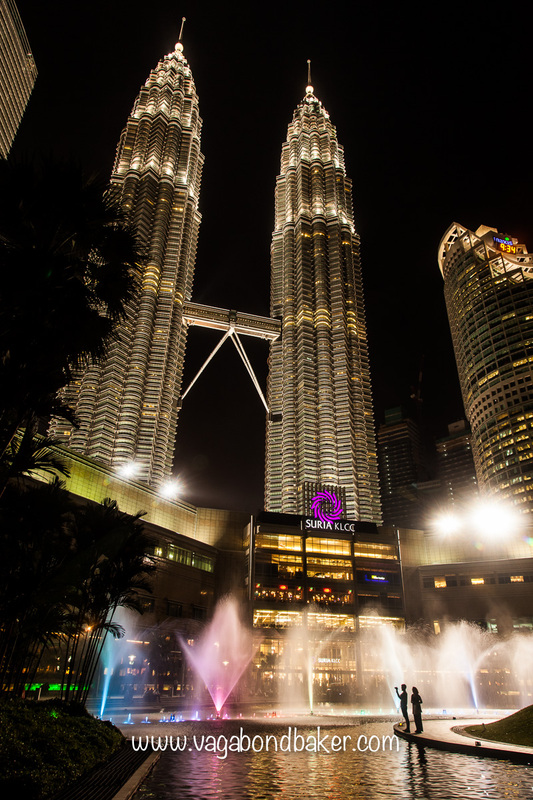 It’s worth visiting the towers after dark, to see the dancing fountains outside the Suria KLCC mall. The fountains dance on the hour throughout the afternoon and evening, a brief show of colour and music and it’s best seen after the sun has gone down. 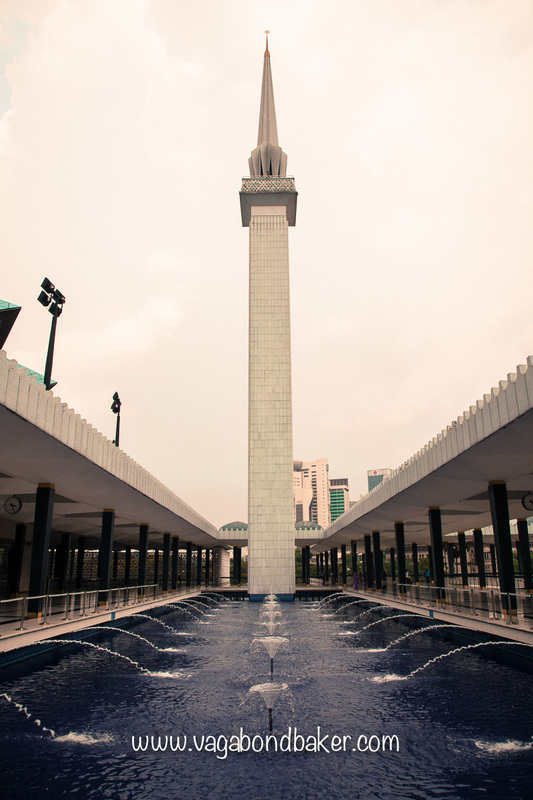 The Sky-Bridge, linking the two towers, can be visited: a limited number of tickets are available each day for the princely sum of 80 ringgit (US$25) each. I’ve never been up, $25 seems a little overpriced for a 15 walk, and if I’m to see a view of KL, I’d prefer the towers to be part of that view, if you know what I mean! 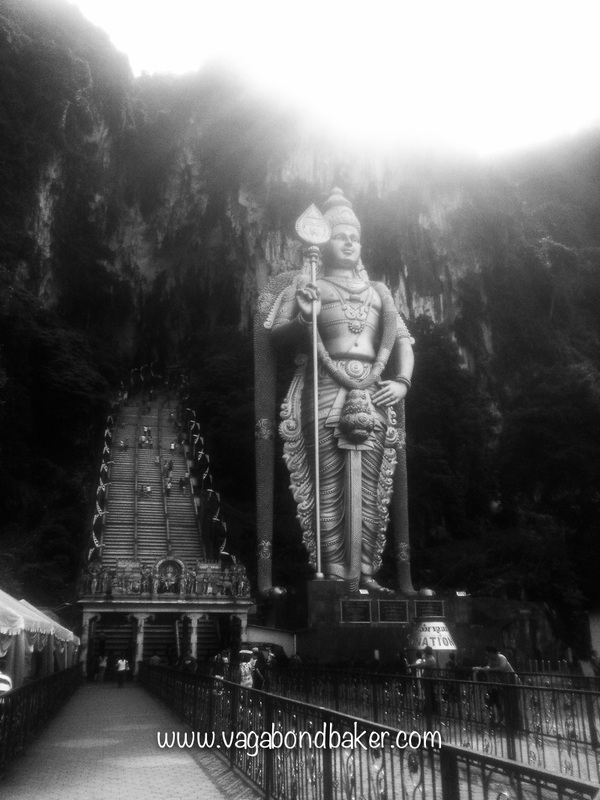 In a limestone outcrop a few kilometres north of Kuala Lumpur a flight of stairs rises up past the enormous golden figure of Lord Muruga to a series of caves beyond. The caves have been an important Hindu temple for around a hundred years, dedicated to Lord Muruga and typically riotous in colour and decoration. Cheeky – and, for me downright terrifying – macaques scamper the stairs, thieving plastic bags from the tourists and the devoted in the hope of food. No bag is safe from their keen eyes! The main cavern is lofty, known as Cathedral cave by the British, and its large size dwarves the tiny temple within. Beyond, another flight of stairs leads up to an open space and a smaller cave. A branch off the main staircase leads to Dark Cave, where you can take a guided nature tour (35 ringgit) through more caverns. 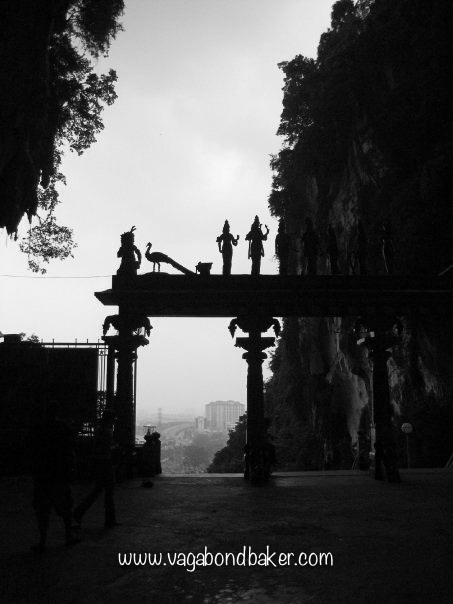 Dark Cave is closed on Mondays, which was unfortunately the day I chose to visit Batu Caves. 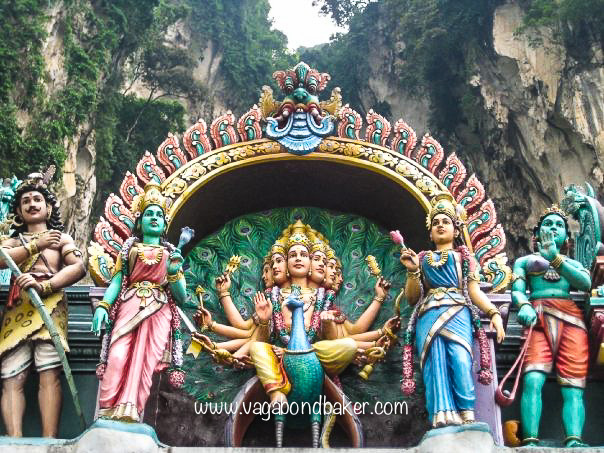 Batu Caves can be reached easily on the KTM Komuter train from KL Sentral or Kuala Lumpur Station, or by bus. You could set off in the morning and be back in KL for lunch, it’s not a long trip. 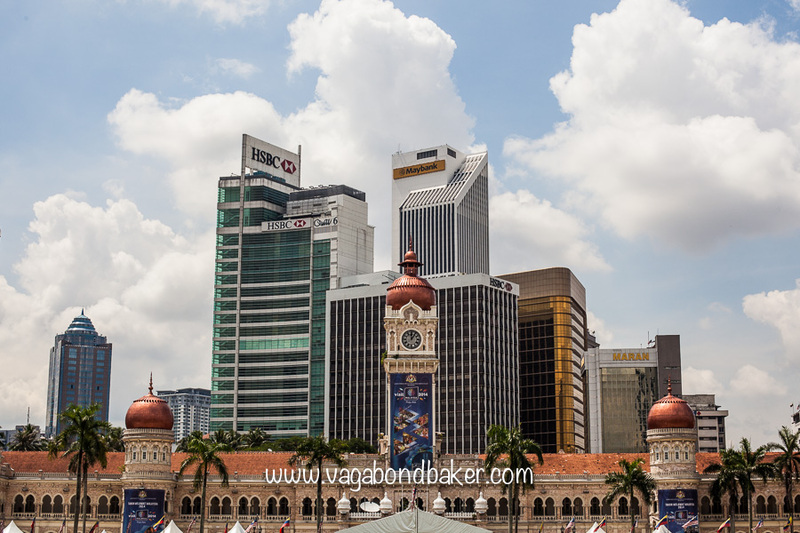 Kuala Lumpur was built on tin; mined by the Chinese in the 1800’s to such an extent that a city grew around it, turning a small settlement on the muddy (lumpur) confluence (kuala) of the Klang and Gombak rivers into the thriving metropolis it is today. Much of the tin at that time was shipped out to the industrial revolution in the west but a canny pewter smith by the name of Yong Koon founded the Royal Selangor factory: alloying the abundant tin with copper and antimony to make pewter. 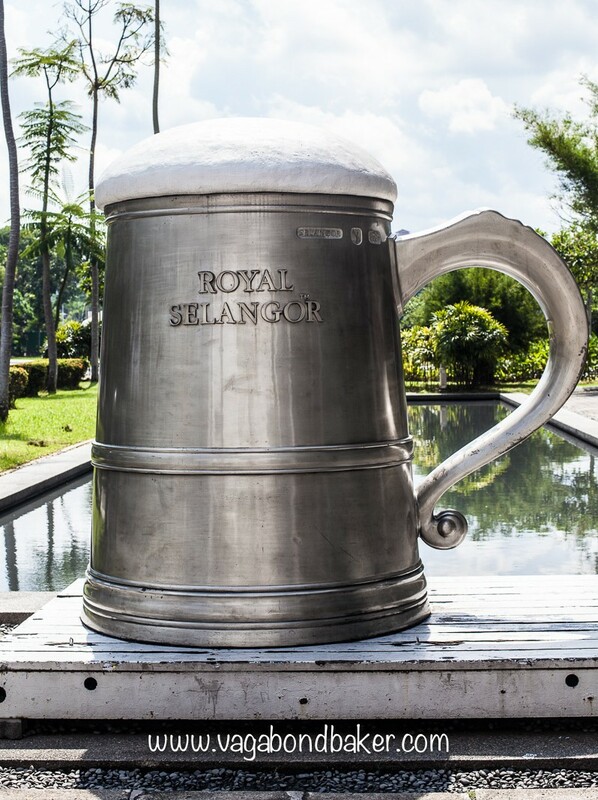 Royal Selangor is now a world-famous brand, the beautiful pewter objects it produces are sold around the globe, even I have a Royal Selangor goblet boxed up somewhere in storage (a lovely Lord of the Rings Ent goblet *geek, I know*). 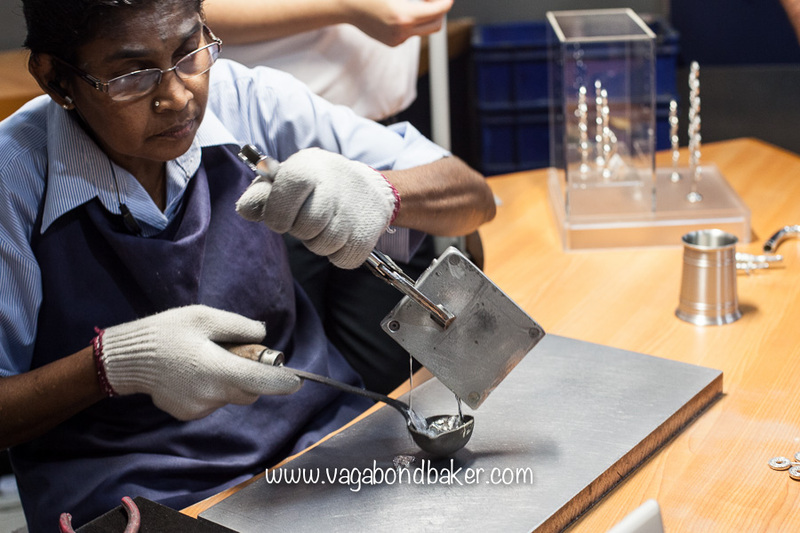 The interesting factory has a visitor centre and it offers excellent free guided tours where you can see the various methods of turning pewter into objects. 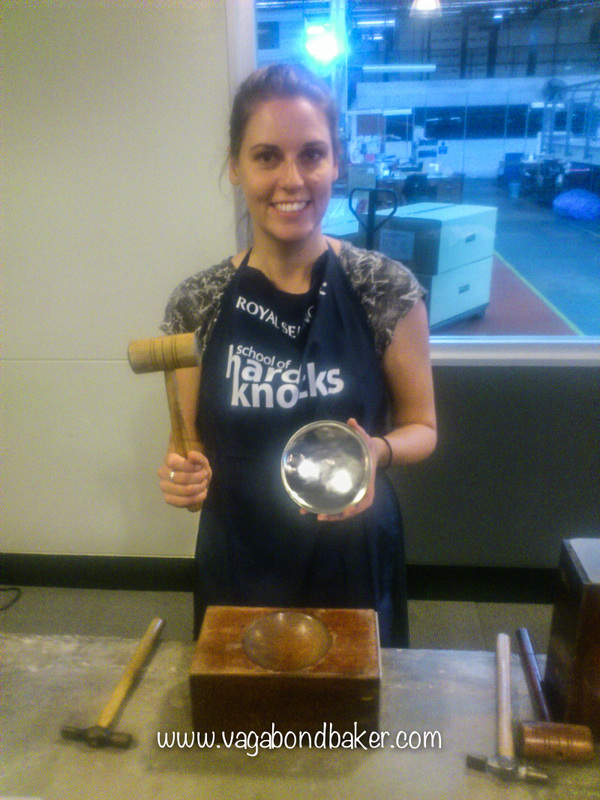 If you are feeling a little crafty, you can even produce your own pewter souvenir to take away from the Royal Selangor Visitor Centre: at the School of Hard Knocks you can hammer out a pewter bowl or in The Foundry you can get a bit more creative and cast a pewter accessory. The free guided tours do not need to be booked in advance, you can simply turn up at the visitor centre, but if you wish to make something then you need to register either on the website or by phone. I opted to try making a pewter bowl, I was the only student in the class so I had one-on-one tutoring! I was shown how to hammer a flat disc of pewter into a dish using a wooden mould. It was fun, and not as easy as it sounds. The School of Hard Knocks session costs 60 ringgit (US$18) and I got to keep my apron. The dish made a great gift to bring back with me, although it came under some scrutiny going through security at the airport in my hand luggage! The Royal Selangor Visitor Centre isn’t the easiest place to get to on public transport unless you go by taxi. 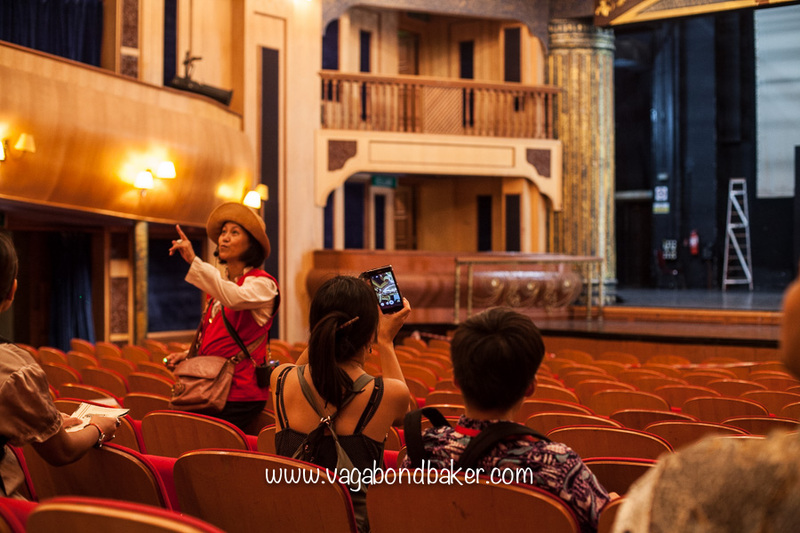 There is a free shuttle bus provided by the visitor centre which picks up from sixteen of the more upmarket hotels in KL. The hostel I was staying in, in Chinatown, was not on that list, so when I filled in the form to register for the School of Hard Knocks I queried if I could meet the shuttle bus. This was fine, they booked me on it, and I met the bus outside the Mandarin Oriental in KLCC park. The minibus driver even dropped me off at a monorail station on the way back making my return journey even easier. 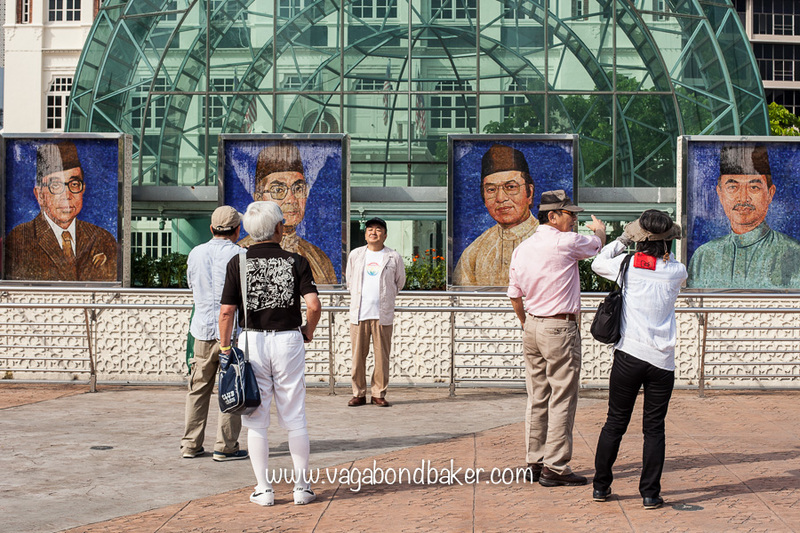 I would certainly recommend the Royal Selangor Visitor Centre, it is so entrenched in the history of Kuala Lumpur and if you spend a little extra, you can make a little piece of that history to take home with you. 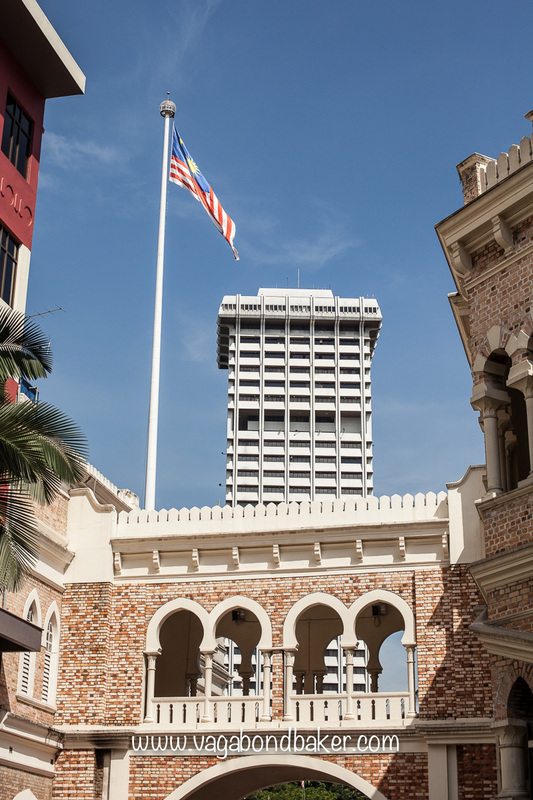 The Kuala Lumpur City Hall provides three heritage walking tours per week, meeting at the Kuala Lumpur City Gallery in Merdeka Square (Dataran Merdeka) at 8.45am every Monday, Wednesday and Saturday. The tour is free and the excellent guide takes you to eleven historical sights nearby, from the original British Government Printing Office to the Old State Railway Station – which is now an interesting textile museum (we went back to it later for a better look) –, this all might sound a little stuffy but bear with me, the walk ends with gin! Our guide, Deanna, was cheerful and knowledgable, I personally found the heritage of the buildings fascinating (maybe because I’m British) – there were lots of little anecdotes and stories to go alongside the history. 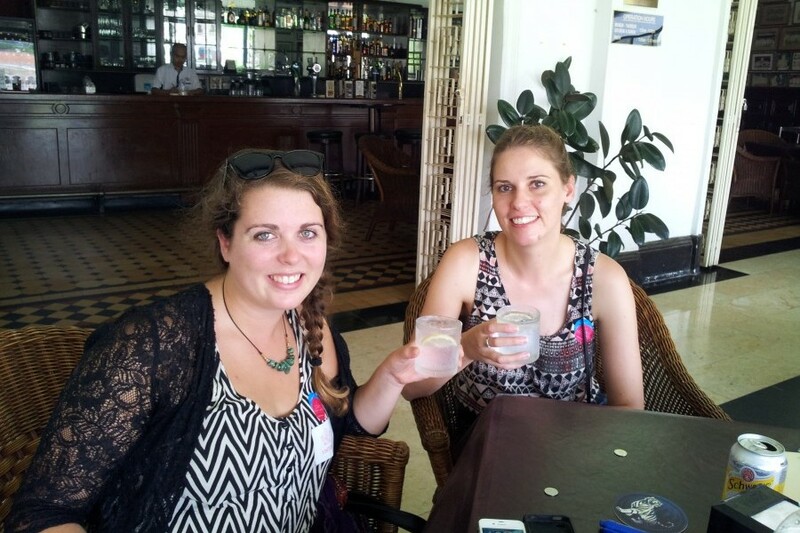 I did the tour with my lovely friend Caley. 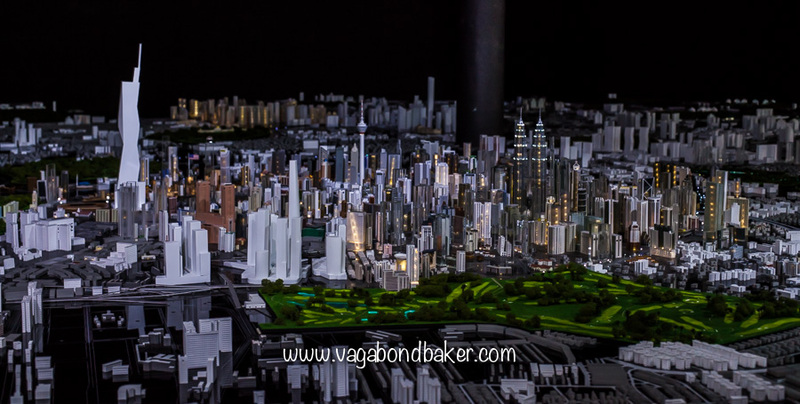 The fancy model of KL above the City Gallery was geekishly fun, the white models: buildings of the future. The tour ended at the Royal Selangor Club, an exclusive club for the British built in the late 1800’s in mock-Tudor style. The doors are now open to Malaysians but don’t go thinking things have changed that much: you’re not getting into the Long Bar as a female: women are not permitted! Caley and I had to sit outside on the veranda and wait to be served, oh the inequality of it! 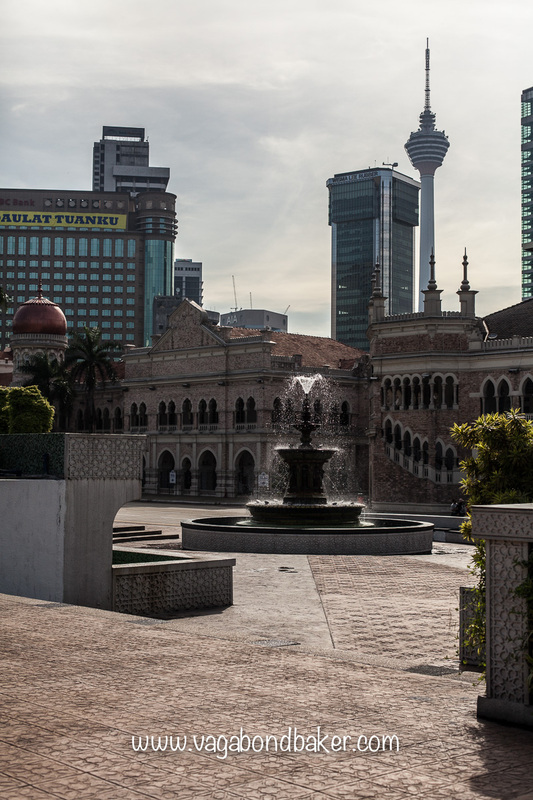 However, the view across the Padang (the old cricket pitch) to the Mogul-style Sultan Abdul Samad Building and the modern towers beyond was rather special, and the whole experience gave us a taste for what it was like back in the time of British rule. 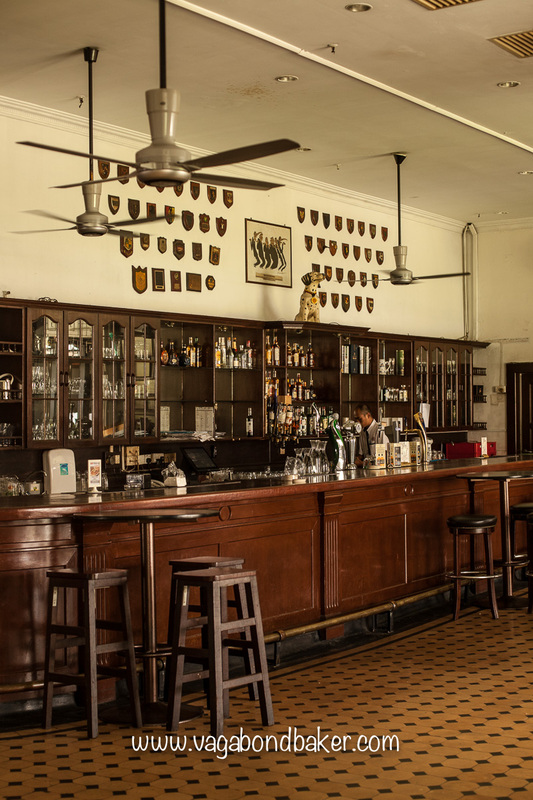 I’m a bit of a ‘collector’ of old colonial bars, and this was one I certainly didn’t think I’d get a chance to drink in (or just outside it, as it happens). 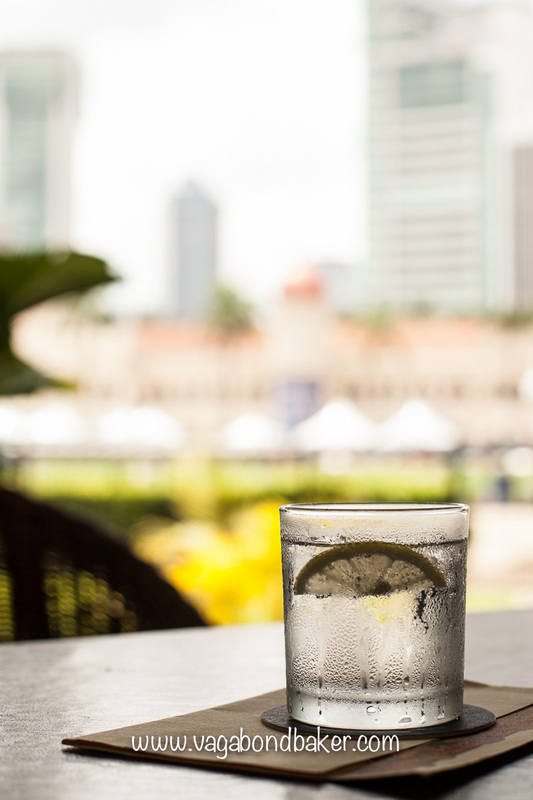 It was the perfect end to the walk, a gin and tonic overlooking Merdeka Square. The Long Bar, photographed from the doorway! So there you go, my six top things to do in Kuala Lumpur. Marvellous Melaka Another Malaysian gem! Munch Your Way Around Melaka’s Markets As A Vegetarian delicious! 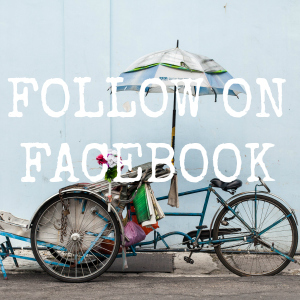 George Town, The Multicultural Jewel of Penang It’s just so darn pretty! Have you been to KL? 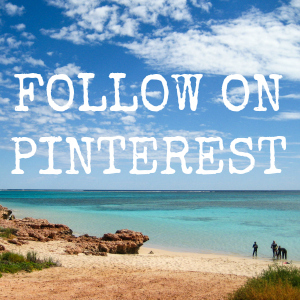 What’s your top tip? Malaysia is my top favourite SEA country! I wasn’t so wowed by KL on my first visit (partly due to the accomm being miles out and a bit grim). I gave it a second chance and I fell in love! Malaysia as a totally different country to the rest of SEA, I love the mix of people, religions and culture – it’s not anything like Thailand or Vietnam. 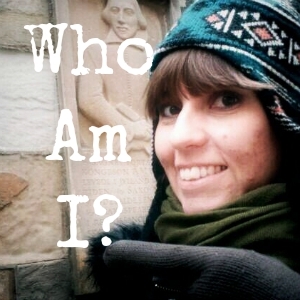 It’s not something I can entirely put my finger on but I just prefer it, I feel at home there! I’m all for giving places a second chance: there’s always new experiences and new things to discover, or even see things in a new light. 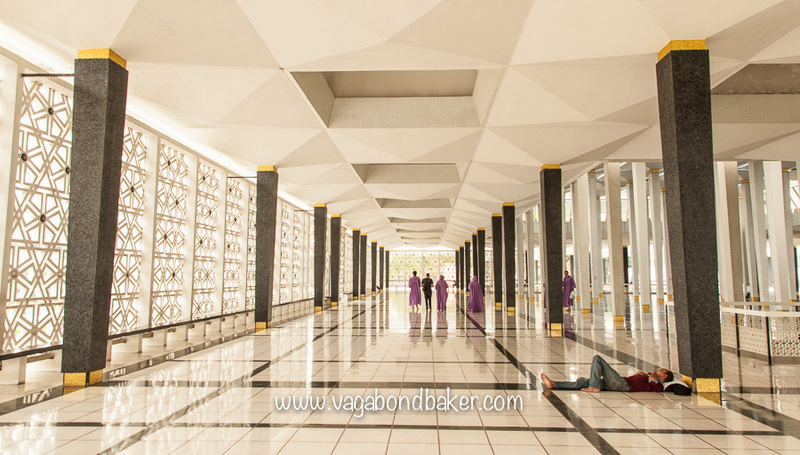 I didn’t have the best of time in Jakarta, but I’d still go back (and be better prepared!). Sometimes the timing just isn’t right!